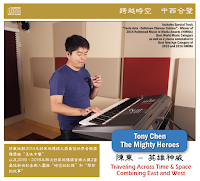 Tony Chen puts things into proper perspective on his website regarding his new release The Mighty Heroes. He says it in such an elegant and distinct manner that it needs to be heard. Chen: This album comprises creations from 2014 to 2016, encompassing a variety of styles that reflect the path I have walked during this time. You will experience melodies and musical arrangements from both East and West, taking you to different realms. I could not have said it any better than the artist. Tony is not a newcomer; this is his fourth release. The title of album is a direct reflection of the music. It all sounds so grandeur, proud and cinematic. I would put the emphasis on cinematic as I could see it easily being a movie soundtrack to an epic film. Well at least the first three tracks paint that kind of picture in your mind’s eye. "The Mighty Heroes, "Memory of Time-Space" and "A Merry Pace" are befitting their titles. All three get the listener excited and mesmerized, as one would be watching a fast moving and important scene in a movie. I do not want to put Mr. Chen’s music in a box and call it soundtrack music but it sure would make a great backdrop for the right motion picture. And that is not all, “Will You Hold My Hand?” walks down a different path of peace and beauty, the parallel world of the previous tracks. This provides a listener with a definitive change of pace and an understanding of the abilities of the artist to be diverse and expressive as much as one can from one track to the next. Tony has the talent to pull off the big changes with his keyboard prowess. The music on The Mighty Heroes lends itself to the human condition and the many changes one can experience during a 24-hour period. The textures, atmosphere and colors created expresses everything the artist indicates on his website and as I noted. The many flavors of cultures worldwide are touched upon, the far east, our western hemisphere and the traditional music combined with the elements of new recording technologies initiates the formation of each track. I appreciated the value and worldliness that the artist could convey throughout his music. Our world becomes one when we listen to music. The internet can have the same effect on us all just as the music does. 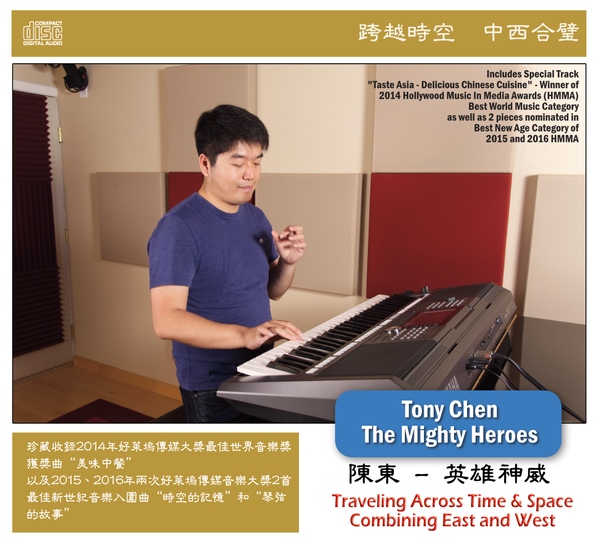 With all the negative things that go on in our world and a tool like the internet to reach a wider audience we have the artistry, pageantry and good vibes of music from people like Tony Chen that can change things for the positive. Although I appreciated the slower paced and more simplistic tracks and always do, I enjoyed the faster paced and more picturesque tracks on offer in the collection even more. It reminded me of some of the greats that came before Tony like Vangelis. If you like a mixture of instrumental music with a contemporary approach and new age foundation, then you will enjoy what The Mighty Heroes delivers. 04. Will You Hold My Hand?